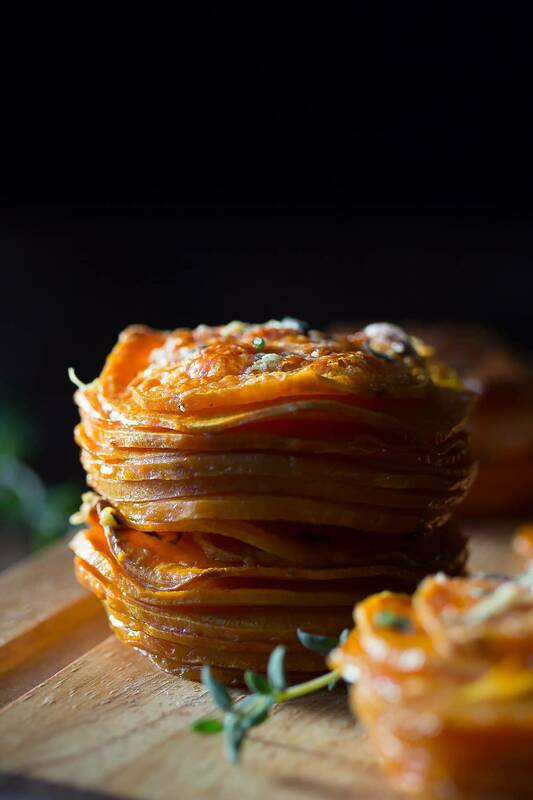 Herbed sweet potato stacks are a great holiday side dish that are impressive to look at but simple to prepare. With fresh herbs and coconut oil. It has been well over a week since you’ve heard from me, and WHAT A WEEK! So I’ve kind of been recovering from it all the past few days. Translation: yoga pants. Netflix. Wine. Repeat. I’m ready to crawl back out into the light, cook some stuff and take photos and share it with you because that just makes me happy. And these sweet potatoes just had to be shared because, well, look at them! As usual, I have no idea which recipe will resonate with people and which ones will not. But hello! These Parmesan & Rosemary Potato Stacks really resonated with you all, and I thought it would be a great concept to revisit. This time I made healthified sweet potato stacks and subbed coconut oil for the butter. I’m going to be honest, I have had coconut oil in my cupboard for a LONG time and I didn’t really know what to do with it. I like healthy food but I’m not so good with these healthy food trends. Anyway, feel free to use regular (unsalted) butter in place of the coconut oil if you don’t feel like paying $15 for a jar. I also used fresh thyme in this recipe, but feel free to use pretty much any fresh herb you have on hand. Here’s a few more ideas: rosemary, sage, tarragon, oregano. to get perfect slices. I held off on buying one forever and I’m SO glad I bought mine, we use it all the time now! The sweet potatoes need to be sliced a bit thicker than the regular potatoes did, since they tend to shrink more in the oven. I cut mine about 3-4mm thick and it was perfect. They were crispy on the outside and soft on the inside. THE KEY to having these sweet potato stacks taste great is to season them well. I put a sprinkle of salt between each layer, and they really needed it. A simple but impressive side dish: sweet potatoes are sliced, brushed with coconut oil, and sprinkled with herbs, salt and pepper, then baked up until the outsides are crispy and the insides are soft. Layer potatoes in the bottom of a muffin tin, brushing with coconut oil, and sprinkling with herbs, salt and pepper between each layer. Sprinkle the tops of each stack with freshly-grated Parmesan cheese. Bake for 45-60 minutes, until potatoes are cooked through. Unsalted butter works as a great coconut oil substitute! If you want to go all out, sprinkle the Parmesan between each layer ? These look good! I am not a cook. How do I get them out of the muffin tin? Hope you like it, Catherine! My roasted sweet potatoes that I consume everyday aren’t as nearly as exciting as these stacks! Come to mama! I feel like it’s still sinking in, but it is definitely a relief! Thanks so much, Jessica! Congrats on finishing your PhD! This is a great way to celebrate. Sweet potatoes in coconut oil are the bomb, especially when they’re all thin and have more surface area to get all roasty. Congrats again, Denise — I can’t begin to imagine how relieved you are that that’s over! What an awesome accomplishment, and you definitely deserve an extended break! 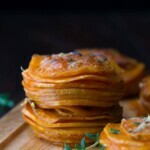 These sweet potato stacks look just delicious, and I love that you healthi-fied them with coconut oil. I love the stuff! Wooooh. So relieved. Thanks, Marcie! Ha! I have long lost coconut oil in my cupboard too! Congratulations on finishing your Phd … wow, six whole years! That sure warrants some serious sitting around on the couch! Happy you’re back with such a wonderful-looking recipe though. These look beautiful – perfect for a ‘posh’ new year’s meal. I don’t know how long it was in my cupboard, so embarrassing! So glad I found it 😉 Thanks so much, Helen! It has been a loooong time coming! Congratulations on your thesis defense, Denise – you must be so relieved it’s over! 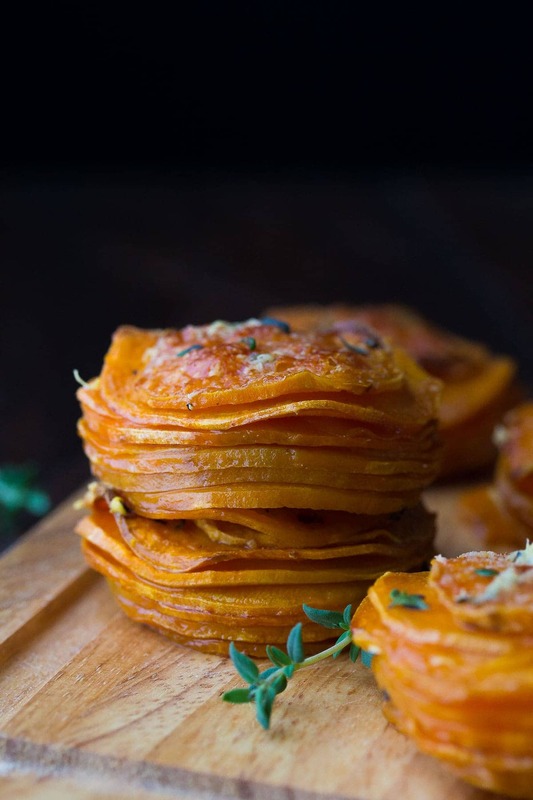 Love these sweet potato stacks – what a great idea. And yes, to yoga pants, wine and netflix – planning on spending a few days over the holidays doing the same thing! Huge congratulations on your thesis defense!!! You deserve that wine and Netflix! 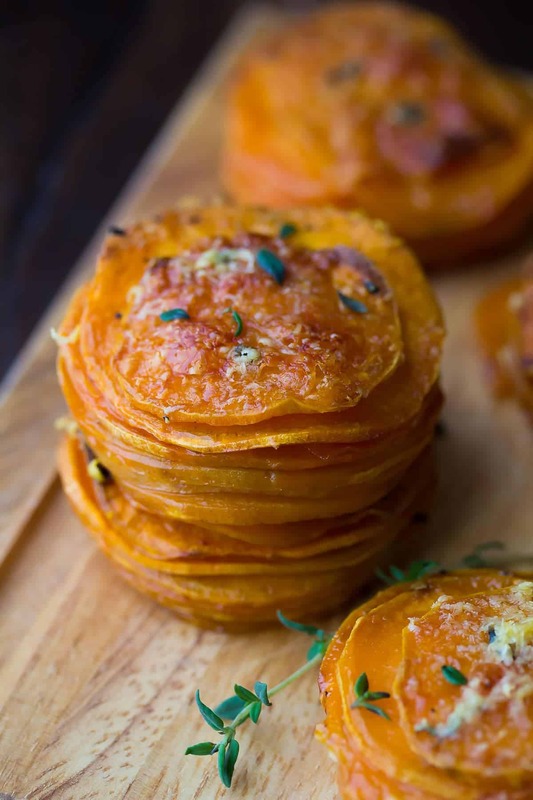 These sweet potato stacks are just gorgeous! I’d be so happy to munch on these! Woo hoo! So happy for you, girly! Enjoy some much-deserved down time, and of course all the wine and Netflix you want! LOL. Meanwhile, I think I’m just gonna dream about these sweet potato stacks all day—they’re absolute stunners! Yah!!! Congratulations!! 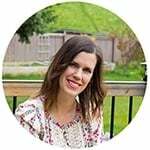 I’m so excited and happy for you that you are finished and have an exciting new chapter coming up! You definitely deserve all the wine and Netflix your heart desires! YES! I am starting to finally think about next year and I’m so very excited 🙂 🙂 Thanks, Izzy! Congratulations!!! Do we need to start calling you Dr. Denise now? 😉 I loved the first potato stacks and these look just as good! Thank you, April! I am SO not used to this ‘Dr’ thing 😉 I think it still needs to sink in!